It is important to remove some of the liquid from the grated pieces, since pumpkin slices excrete liquid when heated. The moist pieces could be “...put into a piece of cheese cloth and squeeze out the water.” [Perkins, Evora Bucknum. Laurel Health Cookery. Melrose, Mass. : 1911] “Boil the pumpkin in the milk until it swells.” [Presbyterian Cookbook. 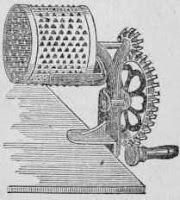 Dayton, Ohio: 1873] I have also tossed sugar with the gratings and after an hour poured out the excess liquid, or slightly fried the pieces to remove some moisture. One pint of grated pumpkin (raw); one quart of milk; six eggs; sugar and spice to taste. Boil the pumpkin in the milk until it swells; then let it get cold; add eggs and sugar with any spice you choose. ... grate the fruit close down to the outside skin; sweeten the pulp; mix with milk and cream; flavor with grated lemon, citron, or cocoa, and bake in a single crust. Take out the seeds, and grate the pumpkin till you come to the outside skin. Sweeten the pulp; add a little ground allspice, lemon peel and lemon juice; in short, flavor it to the taste. Bake without an upper crust.